Alice’s Wonderland is a 1923 Walt Disney short silent film, produced in Kansas City, Missouri. The black-and-white short was the first in a series of Walt Disney’s famous Alice Comedies and had a working title of Alice in Slumberland. The film was never shown theatrically, but was instead shown to prospective film distributors. It was included as a bonus feature in the Special “Un-Anniversary Edition” of Alice in Wonderland. Alice (Virginia Davis) visits the Walt Disney Animation Studios, where the animators (including Walt Disney) show her various scenes on their drawing boards. 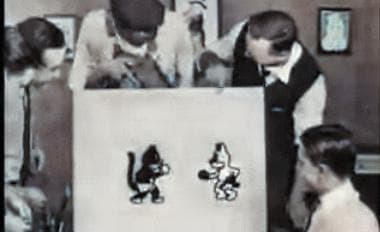 A few of them: a cat dancing to a cat band; a mouse poking at a cat until it moves; a couple of mice boxing, while the animators crowd around cheering and acting as corner-men. That night, she dreams of taking a train to cartoon-land, where a red carpet reception awaits. She appears in live action. They have a welcoming parade, with Alice riding on an elephant. The cartoons dance for her, and she dances for them. Meanwhile, lions break out of the zoo. The lions chase her into a hollow tree, then into a cave and down a rabbit hole. Finally, she jumps off a cliff and awakes back in her bed.